I love reimaginings of Beauty and the Beast; it's always so fun to see what different twists each author brings to the story! 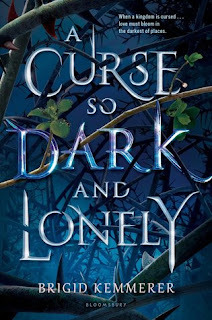 And so it was with great pleasure that I devoured A Curse so Dark and Lonely, by Brigid Kemmerer (Bloomsbury YA, January 29, 2019), because her twists are great fun and add considerably to the basic story. "Beauty" is Harper, a girl from our world, with a family in trouble, cerebral palsy, and a very strong will. "Beast" is Rhen,, who lives in a castle haunted by the curse of a nasty enchantress, with his faithful Commander of Guards, Grey, his only companion. 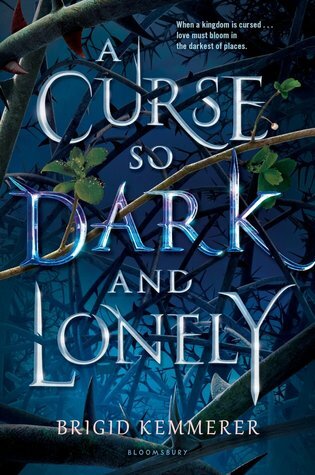 The breaking of the curse requires the usual love between Beauty and Beast, but in this retelling, Rhen is only a beast for part of each season of the curse, and reverts to human back at the beginning of a new season, over and over again. Grey can pass into our world, from whence he has brought many young women, hoping one will break the curse. Harper wasn't a girl he intended to bring back, but when she witnessed what looked to her like a girl being kidnapped, she intervened...and got taken instead. Harper is determined get home....and smart enough to realize how impossible that is pretty quickly. Rhen (still human) and Grey and Harper, alone in the castle with Harper gradually picking up the clues that things are terribly awry, makes for good reading all by itself (they are all interesting characters, hiding things from each other and themselves), but this is just the introduction. Where this retelling really broke the mold, and I loved it for doing so, was acknowledging that there's a world outside the cursed castle. Rhen is the prince of his country, and his people have been suffering, and though he took action at the beginning to try to ameliorate things by closing the boarder, an enemy invasion is imminent. The closed boarders and lack of cohesive government have caused more mundane problems as well, and Rhen has thought there was nothing he could do about any of it and so he didn't bother trying. Harper blazes through this misconception like a meteor. For instance, if your castle produces magic food every day, you feed it to the starving masses. And her fresh perspective works wonders in Rhen. His brain, frozen by the bloody horror of his situation, starts to think of the bigger political picture, and what he can and cannot do, and the story become one not just of fairy tale romance, but of Political Machinations/Desperate Schemes, during which romance may (or may not) be happening. Viz the romance--this isn't actually a love story, though there's enough tension and maybe love in the future not do disappoint the romantic. I appreciated that Harper, who is in fact a kidnapping victim, doesn't start swooning right and left over either of the two handsome men she is stuck with. Instead, she thinks about them, finding things to question, and things to admire, in both. And she brings hope to both that there might be an end to the curse....as all three of them do some hard thinking about what they are responsible for, and what they aren't, and what they can do with the choices they have been given. So lots of interesting twisting of the parent story (there are more that I didn't mention) make this a fabulous read for fairy tale fans, fans of desperate political/military maneuvering, and fans of slow burning trust into (?) love in the future. Harper is perhaps a bit too good to be true, but her strengths and smarts allow her to play her role convincingly. The author worked hard to make this a realistic portrayal of someone with CP, and there are things that are hard for her to do as a result (dancing, for instance), but her CP doesn't define her, or keep her from accomplishing what she sets out to do. Thinking about this, I'm very glad that she struggled with knife throwing (one way to pass the time in an enchanted castle where you are being held against your will), because it kept her from being too perfect (she never does get really good at knife throwing). If Harper is maybe too good to be true, the evil fairy character is too one-dimensionally bad to be true. Her motivations are petty (at least, that is how they are presented to the reader) and she's sadistic with no clear point to it all (she reminded me of the evil computer overlord in "I Have No Mouth and I Must Scream"). Maybe there is more to her that we didn't get to see here, but it may also be that she's just a really villainous person because that's how she rolls. I like my villains to have, if not possible redemption arcs, at least a backstory that's not petty....so I'll hope for the former. It's a long book, almost 500 pages, but the twists keep adding interest, and keep coming, so it didn't feel dragged out. Most of the story is set in the magic world, but toward the end Washington D.C., and new characters, come into it, bringing fresh energy to the story (and a sweet gay couple). Give yourself a nice long weekend to read it in, and then join me in waiting for the next book (at least one sequel has been promised). Ooo, this sounds very much like something I might like! I am trying not to add to my book list until I get through a good chunk of the unread items lingering on my ereader but I am very tempted! I loved Kemmere's Letters to the Lost and More Than We Can Tell so I've been eagerly awaiting her next book! But it's starting to feel like everyone in the world got an ARC but me! Guess I'll just have to wait for the release and hope my library ordered it! I love re-tellings of fairy tales and you make this one sound awfully good. Thanks for the recommendation. Oh wow, okay! When I saw "beauty and the Beast retelling" I wasn't sure it was going to be for me -- that's SUCH a hard story to retell in a way that's not frustrating -- but you have totally convinced me. I love that she doesn't go swooning over either of the two characters. Good for her!